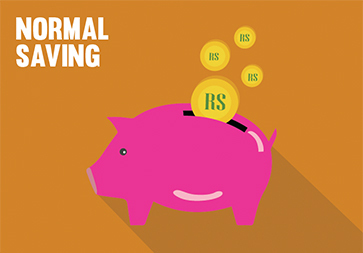 Normal Saving Account is focused for business holders. Interest rate is fixed on Monthly minimum balance @4% per annum and corresponding interest will be paid on quarterly basis of fiscal year. Minimum balance required for concerned account is Rs 100.00 and immediate cheque book will be issue on maintaining minimum balance. No withdrawal limitation applied for this product however pre confirmation for withdrawal is requested. Normal Saving Account is focused for business holders. Interest rate is fixed on Monthly minimum balance @4% per annum and corresponding interest will be paid on quarterly basis of fiscal year. Minimum balance required for concerned account is Rs 100.00 and immediate cheque book will be issue on maintaining minimum balance. No withdrawal limitation applied for this product however pre confirmation for withdrawal is requested.